The Theatre Royal, Drury Lane is the oldest theatre in the world with a record of continuous performances and over the course of its history almost every great name in British theatre has been associated with it. Its unique status caused it to be regarded as a national theatre long before there was such an institution and, under David Garrick, Drury Lane was described as the fourth estate –'Crown, Lords, Commons and Drury Lane play-house'. The National Anthem and 'Rule Britannia' both had their first public performances there. George III survived an assassination attempt as he entered the Royal Box and Richard Brinsley Sheridan responded by adding a new verse to 'God Save Our Gracious King' that remains part of the Anthem. The Entertainments National Service Association (ENSA) was based there during WWII and broadcast to the armed forces in 'all theatres of war' from 'the world's most famous playhouse, Theatre Royal, Drury Lane'. 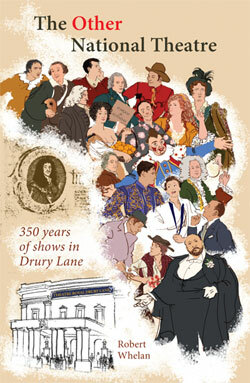 Drury Lane has provided a unique location for the debate that has been carried on for four hundred years about the nature of theatre : is it about the words written by the playwright or the images created by the stage production? Successive managers struggled to meet expectations of what the 'home of the national drama' should be putting on, which often conflicted with the need to make a profit and pay the wages. In 1879 Augustus Harris took over the management and abandoned the notion of being the 'national theatre'. An attempt by Basil Dean to revert to national theatre status in 1924 was unsuccessful, and Drury Lane has been, since the 1920s, the home of musical theatre from Oklahoma! and My Fair Lady to Sweeney Todd and Miss Saigon. The back-story of the theatres of Shakespeare's London and their closure in 1642 by the Puritans. 'In Rep': Until the 1860s, Drury Lane operated the repertory system, with a change of programme every night or every few nights. 'In Rep' tables throughout the text show exactly what was being performed during one week of each decade of the theatre's history until the 1850s (or one month of each decade for the 1660s to the 1690s when records are incomplete). Tables showing the relative popularity of Shakespeare's plays in the years following the re-opening of the theatres in 1660; most popular productions of David Garrick's management; his Shakespearean productions; the change that came over the repertoire under Sheridan's management; Alfred Bunn's struggle to make Drury Lane 'legitimate' in the face of mounting losses; and the fall and rise in the rent paid by managers in the nineteenth century. Prologues delivered at the opening of the second Theatre Royal in 1674 (by John Dryden); at the opening of the third Theatre Royal in 1794 (by Richard Fitzpatrick); at the opening of the fourth Theatre Royal in 1812 (by Lord Byron); and the most famous prologue of all, written by Samuel Johnson for the opening of David Garrick's management in 1747, which set out the dilemma of the manager of an unsubsidised theatre who wants to put on good plays. Four pages of full-colour illustrations, with black and white illustrations throughout the text.